When I first saw this vintage drum lamp shade at a flea market in Oklahoma City I wasn't sure if I wanted to turn it into a mobile or a fun photo display but then realized it could serve a practical purpose instead! 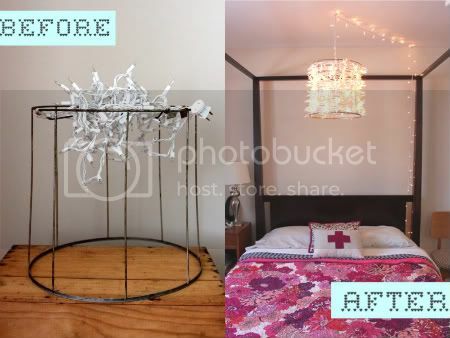 I used four strands of white wire Christmas lights that I carefully wrapped around the lamp frame and then attached two plant hooks into the ceiling to hang it over our new bed. It's large scale makes it perfect as a focal point in our room and the glow of the light is absolutely beautiful after dark! 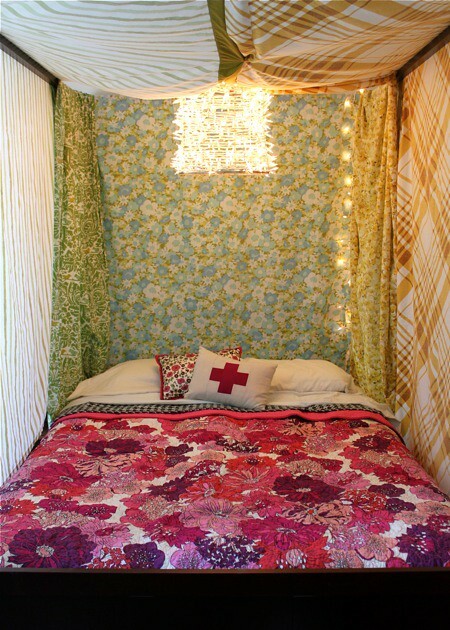 To celebrate 1/11/11 we built a bed fort with a few of my favorite vintage sheets and a random old curtain panel. We read books and had a tickle fight and took some funny Instax photos to mark the occasion! You can still join us for Project ReStyle, find details here. I've really been enjoying the variety of ideas and ReStyles that are being shared in our Flickr group! 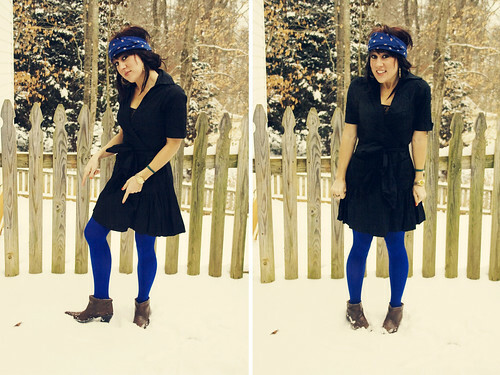 A refashioned vintage dress from Krust. 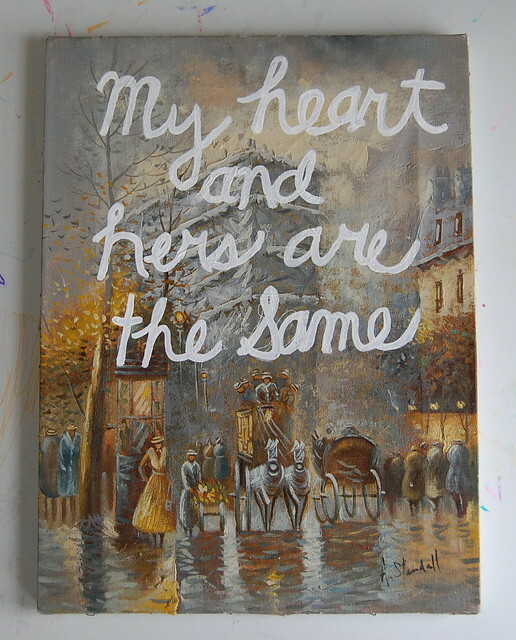 I have been enjoying this concept of painting on vintage art by Paper Sparrow... as well as Diane Reeves below. Who knew you could ReStyle your cowboy boots! 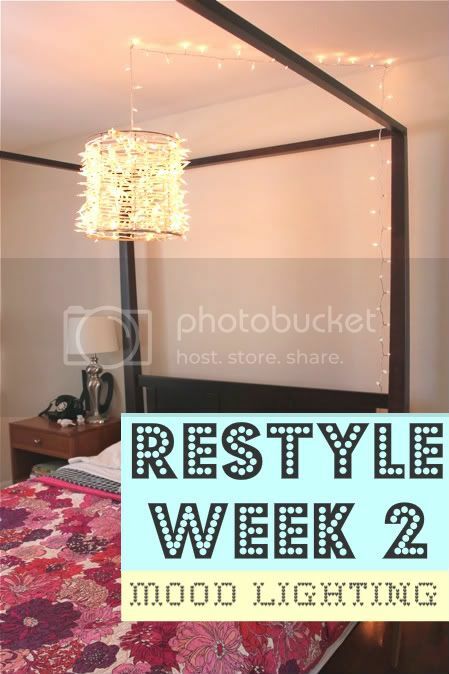 Check back every Wednesday for more posts sharing ways to refashion and restyle unwanted or unloved things into something fantastic! Elsie and I have been so excited by the response! I love that so many of you are joining in and sharing because it shows how many of you are already restyling experts! I LOVE the fort and the revamped drum shade. That lighting turned out really great! this is amazing. i love every part of this post! I'm crazy for your new lamp and fort! But all those ideas are so great and pretty! What a great post. How cozy and romantic! I love it. Love your new bed!!! It is so grown up!! :) I also can't wait to see more pictures of your new house!! What a great idea the Project Restyle is, I love looking through all of the photos!!!!! oh. my. goodness. Great job rachel! Ive been wanting to do something with my white christmas lights for our TV room 'cause it doesnt have an overhead light like that and I think this will be just great :) Oh, and I love the bed fort, you're so creative! WOW! I love that lamp and the fort it's in;) Thanks for sharing. That lamp is amazing. Excellent job! These are all so creative! Good job ladies. Great job! It looks marvelous! I recently updated my living room ceiling fan with a re purposed lampshade. Maybe I should submit it to the Project Restyle Flickr Group! Oh wow, I'm IN LOVE with that painting of the lake... Lochness?? To die for. I love the painting over vintage art pictures. So cute!!! love the canopy fort. I'd love to have a canopy type bed, but I live in an attic with super slopey ceilings...I should just attach sheets to that. and wow. such great restyling going on! I love that drum shade with all the lovely twinkle lights! I just moved to Oklahoma City, so I'm curious - what flea market did you find the shade at? Love , love, love the new lamp!! I love the other restyled canvas and the dress and boots are super inspiring too! rachel! that light is adorable! Wow, I love the lighting! Our family is growing and in the next couple of months we will be trading our bedroom with walls for a space in the basement. I have been thinking about how to make the space comfy & cozy and I think white lights are just the thing. Thanks! that lamp is amazing! what a genius idea. love the fort, too!! The revamped shade is gorgeous and I love the fort! That bed fort is amazing! I think I need a bed fort every day :) Thanks for sharing. LOVE the lamp idea! And the paint on vintage pictures is so original! This project is DEFINITELY going in my inspiration folder! Oh my gosh I LOVE your fort! I've always wanted a 4 poster bed so I could hang curtains and close myself off...loverly! Oh my goodness, that lamp is INSANELY beautiful. I'm definitely inspired! Your revamped light and fort is so damn inspirational! It's settled, I have to will my creative side out of atrophy and get to work repurposing thrifted bits! Looove the restyled vintage paintings, too! What a great use for Christmas lights in the off season (or year round). Yours is one of a few four post beds I've seen this week and now I'm wishing for one. I love the idea of draping sheets and creating a fort! Oh my goodness Rachel! That light is exactly what my bedroom needs! I can't wait to put mine together, and with Christmas lights on clearance right now it will certainly be a super-budget friendly project. Thanks for sharing this idea! Rose: we live in a "space in the basement. It's like a den at the bottom of the stairs with no wall & door. Can be TOTALLY cozy! This mini light lamp idea is really brilliant. I think I am going to have to lift it! Can't tell you how much I loved looking at this creative post and seeing lyrics from my favorite band painted on that vintage canvas. Your bed fort, oh! I love it so much. It would be so fun to recreate :) And your lamp is absolutely gorgeous! i LOVE the lights. the bed & fort are just perfect. LOVE the light and the restyled art work!!! Oh, lovely!! :) Love the sheets + your lovely lamp! And painting on vintage paintings?? Eek! Inspired! I *love* this lighting idea! Totally doing this in my own room. that lamp is super cool!! i love it. my friend geoff used to always take painting and draw on them....he's an amazing artist. my favorite thing he did was take this cheese ocean scene that my friend Chris had hanging over his fireplace (he got it from a dentist office that was going out of business)....geoff "stole" the painting and quickly drew these huge figures of the Village People looming over the water. It was SO funny and awesome....he sneakily replaced it over the fireplace. Chris came home and it was a couple of hours later that he noticed it, it was hilarious!